This fall, in keeping with our tradition, we will commence the new academic year by convening the UVM community for our Convocation Ceremony in the Patrick Gymnasium on Sunday, August 26. The ceremonial celebration will begin at 6:30 p.m. It is free and open to the public. Tickets will not be necessary. Faculty and staff who wish to attend are invited to sit in reserved seating near the platform. Academic regalia is not necessary. Following the Ceremony, we will walk in procession as a community to the University Green for the Class of 2022 Twilight Induction. In case of rain, the Twilight Induction Ceremony will be held indoors at Patrick Gymnasium. The weather forecast will be assessed and a decision will be made by noon, Sunday, August 26. This information, as well as additional details, will be available on the Convocation web site: Convocation 2018. 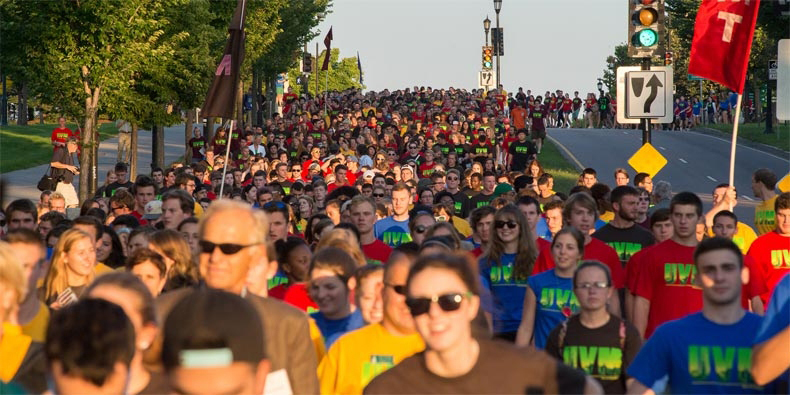 I hope you will join us for this inspiring occasion as we welcome our new students in the Class of 2022 to campus and usher in a new academic year at UVM. As we begin the 228th year of the University, it is a great privilege to pursue our academic mission on this beautiful historic campus overlooking Lake Champlain with the support of this exceptional and vibrant community of staff, faculty and students.